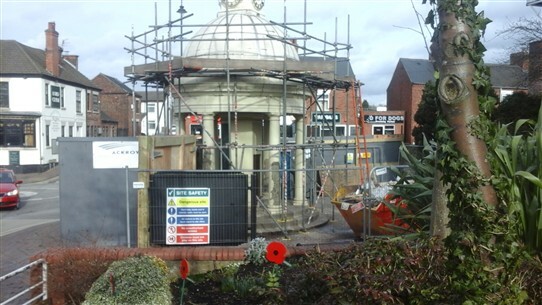 The Kimberley War Memorial is undergoing a major refurbishment as shown in the accompanying photograph. I believe this project has been initiated by the Kimberley Town Council with financial assistance from various Trusts and Charitable organisations. 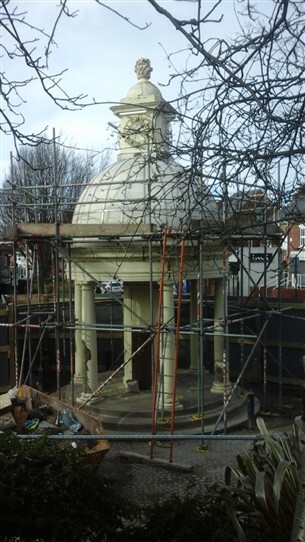 Apparently this project has involved a lot of work to its foundations and also to its domed capping. It will also involve new and improved flower beds. The work commenced several weeks ago and should be completed within the next few months. I along with many others I will be looking forward to the summer months and seeing the finished project; especially with the approaching commemorations for the one hundredth anniversary of the end of World War 1. On a personal note, I am looking forward to when I will be able to relax on one of the garden seats and as the saying goes “watch the world go by”. Note; - There are numerous accounts and information about this memorials design and initial building available on the internet. This page was added by John Pownall on 05/03/2018.